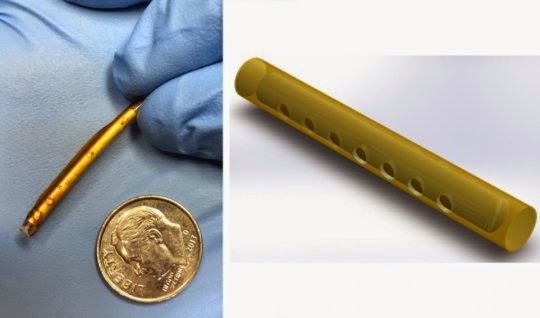 Scientists from the Oak Crest Institute of Science, in Pasadena, CA, report that they have developed a matchstick size implant, similar to a contraceptive implant, that successfully delivers a controlled, sustained release of ARV drugs for up to 40 days in dogs with no adverse side effects. "To our knowledge this is the first implant to be used for this purpose," says Dr. Marc Baum, president and founder of Oak Crest. Daily administration of oral or topical ARV drugs to HIV negative individuals in vulnerable populations is a promising strategy for HIV prevention. However, adherence to the dosing regimen has emerged as a critical factor in determining effective outcomes in clinical trials. "This novel device will revolutionize how we treat or prevent HIV/AIDS as it delivers powerful HIV-stopping drugs and eliminates one of the key obstacles in HIV/AIDS prevention -- adherence to proper dosing regimens," he adds. The team plans to develop a new version of the implant that would deliver the medications for a full year.